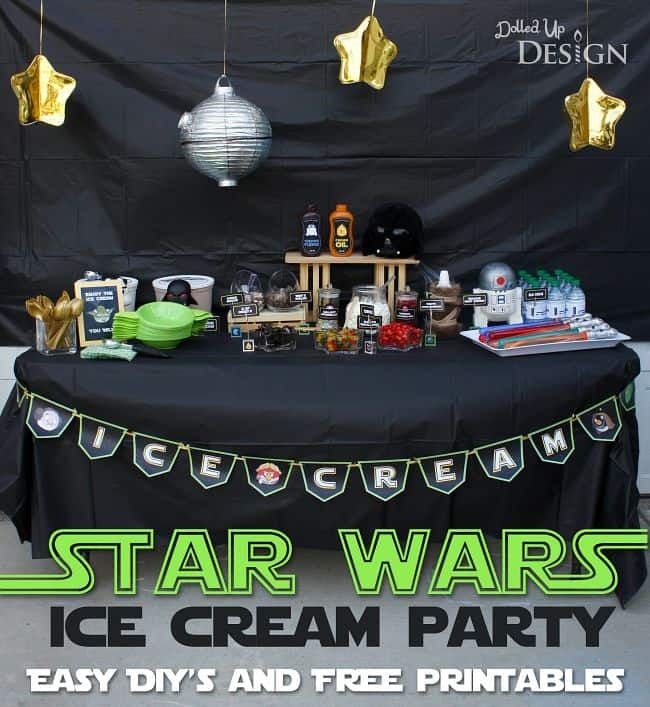 Star Wars Ice Cream Party + FREE Printables! 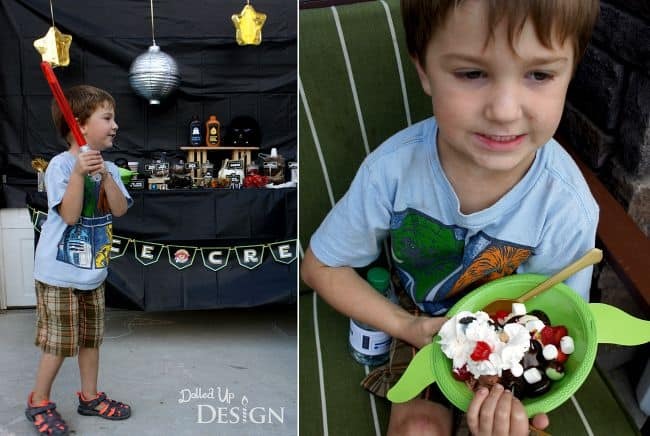 This Star Wars Ice Cream Party post is courtesy of our contributor Chantelle of Dolled Up Design…We hosted our 2nd annual neighbourhood Ice Cream Social at the end of August and I had a ton of fun with this year’s Star Wars theme with a unique Angry Birds twist. 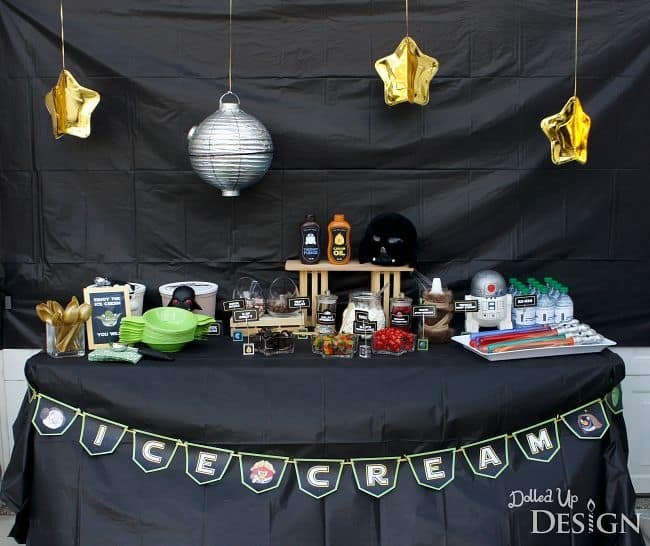 With a few simple DIY details and a bit of creativity naming the toppings, it was easy to create a whimsical ice cream sundae bar that paid homage to the ever popular movie series. The Death Star is a very iconic element in Star Wars, so I decided to include it as part of my background display. Using a paper lantern I had at home, a bit of silver spray paint and a cut-off paper cup, it was a cheap and easy decoration for my party. I began by cutting down the paper cup and hot gluing it onto my paper lantern to create the laser beam pod. After a quick spray paint, I added the final black line details onto the dish and around the lantern using a black sharpie marker. I love using paper plates for cheap and easy decorating. I found these gold star shaped paper plates at Dollar Tree and was originally planning to just tape them up on my black plastic tablecloth backdrop to create a galaxy of stars. Instead, I decided to fold them in half and hot glue three plates together to create more of a 3-D effect. 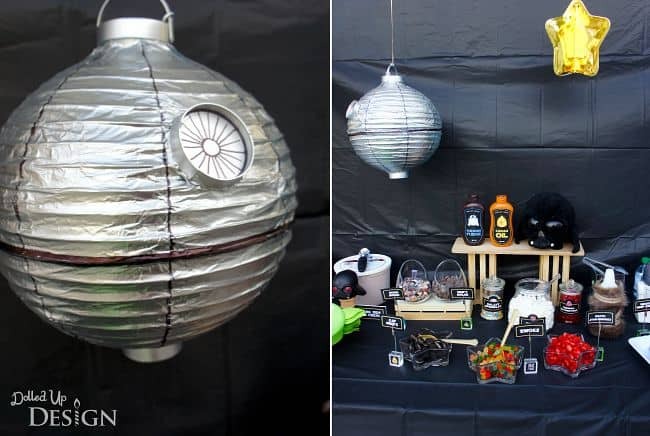 These looked great hanging alongside my Death Star and spinning in the breeze at our outdoor party. 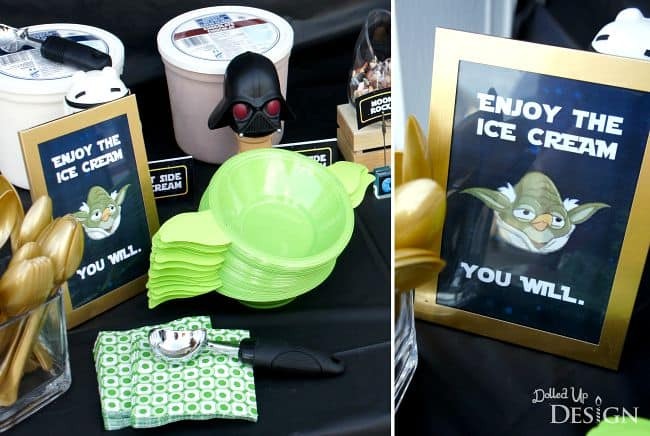 Guests at our ice cream party enjoyed their sundaes out of my custom made Yoda bowls. To create them, I printed this template onto green paper, cutting out each of the ears and then stapling them onto either side of my 7” bowls. I used vibrant green plastic bowls for our ice cream, but these would also work well stapled onto green dessert sized paper plates for cake or pizza. 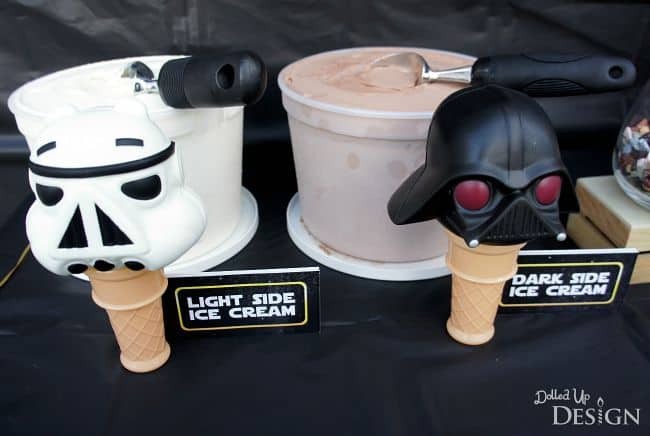 It was a lot of fun coming up with the Star Wars themed names for my different ice cream toppings. 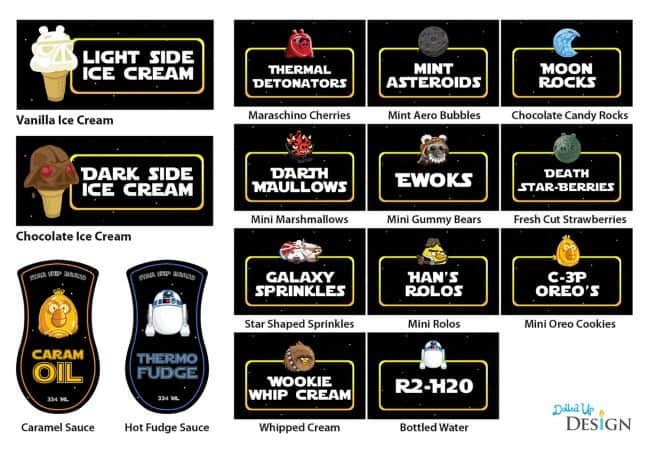 I created these printable labels to accompany each food item and help carry out the Star Wars theme. The adults all seemed to enjoy the character references, and the kids were excited by the wide variety of candy and sauces to load onto their ice cream sundaes. 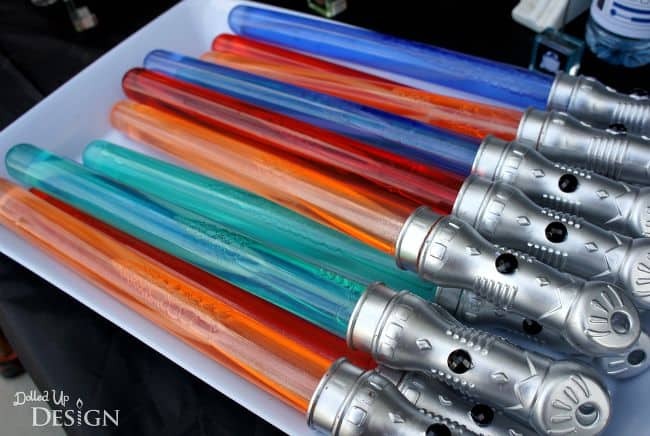 For the kids at the party I also DIY’d these simple bubble wand Lightsaber’s. After buying basic bubble wands, I was able carefully take them apart and spray paint the plastic handles silver. Once dry, I glued on black rhinestones for the power button and then reassembled the colorful Lightsabre’s to put out on my party table. 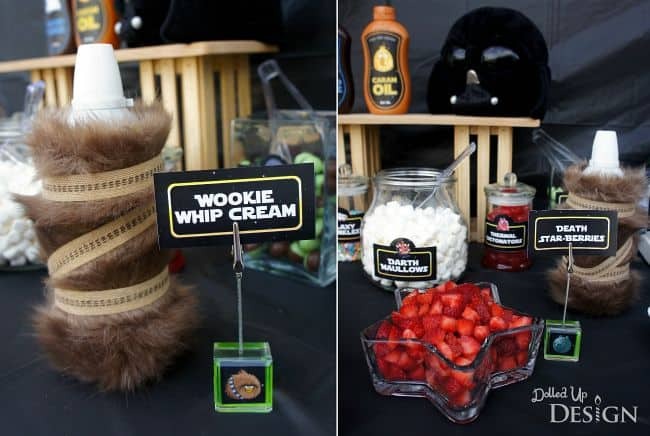 One final DIY detail I made was the cover for the Wookie Whip Cream. With a bit of faux fur and the right ribbon, this is a simple way to transform a simple object or container into something Star Wars inspired. This would look great around a cake stand base or over a vase on your party table. With Star Wars Episode VII: The Force Awakens coming out soon, I foresee Star Wars being a very popular party theme over the coming year. It is a great theme to work with and there is certainly no shortage of creative ideas out there for those looking to be inspired by the Light Side or the Dark Side. We’d like to send a big THANK YOU to Chantelle for sharing these incredibly creative party ideas with us. Her parties are always easy to recreate and kids love them! Plus how awesome is it that she gave us the FREE printables?! Be sure to follow her on Facebook to stay updated on all her fabulous ideas. Thank you so much! this was perfect and awesome! 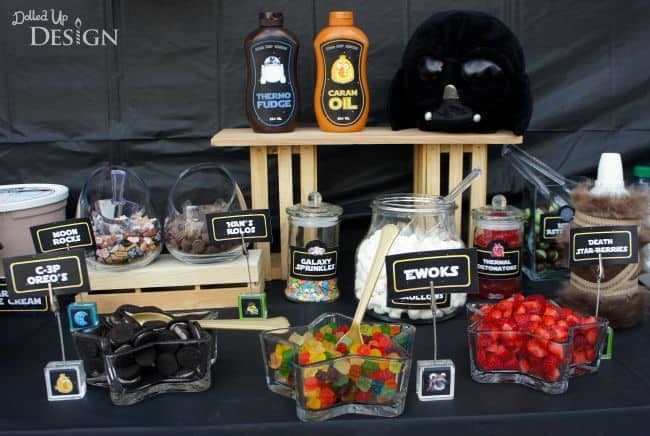 Cute, what a great Star Wars Themed Party! We’ve done a Star Wars party with DIY paper craft stuff. LOVE the labels!!! Is there a link to the “Enjoy the Ice Cream You Will” sign? 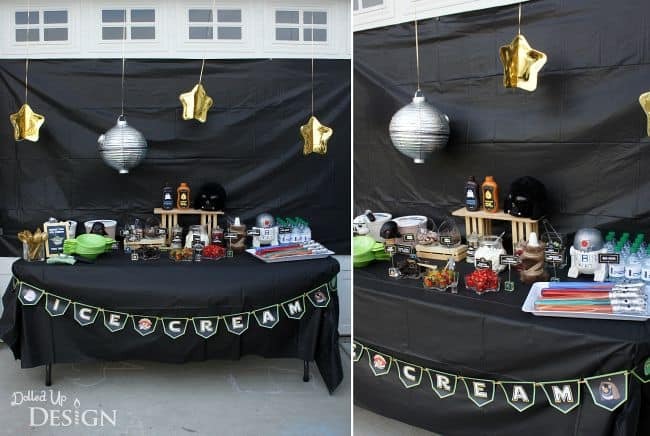 I’m throwing my daughter a Star Wars party this weekend and she would love this idea! Thanks so much! Hi Michelle! I’ll check with Chantelle to see if she has this as a free printable.